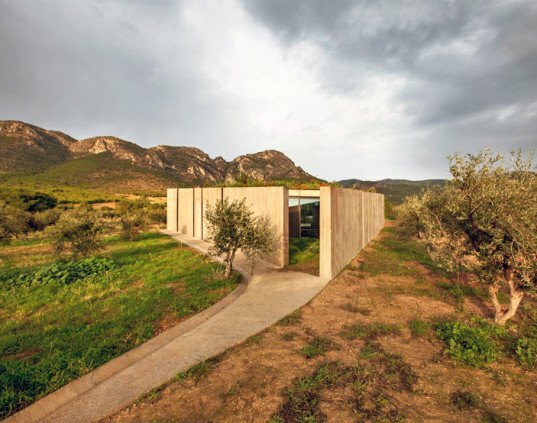 This triangular concrete home in Megara, Greece designed by Tense Architecture Network has a huge window that overlooks beautiful olive groves and Gerania Mountains. The wings of the home frame a central courtyard that acts as an extension of the open-plan leaving and dining area. The house has two blocks that follow the gentle incline of the site and taper out toward a mountain range on the northern side. A courtyard separates the living spaces and sleeping areas, while the larger part of the home that contains the living and dining rooms features views of the mountain. The kitchen and dining areas are connected with a strip of light running above the furniture. The dining table is suspended from the ceiling by a metallic flue. Huge glass surfaces open onto protected garden areas and create a beautiful light effect at night, emanating a soft glow which illuminates the surrounding olive grove. 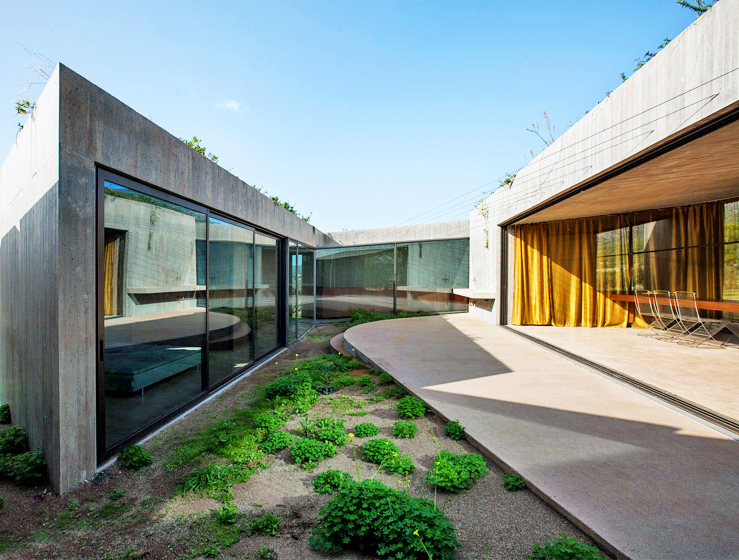 The rugged quality of the concrete is juxtaposed with the lightness of the glass and fits perfectly into the landscape. The courtyard separates the living spaces and sleeping areas. The building tapers out toward a mountain range on the northern side. The house has two blocks that follow the gentle incline of the site. The larger volume contains the living and dinning rooms. The space features views of the mountain. The kitchen and dining areas are connected with a strip of light running above the furniture. The dining table is suspended from the ceiling by a metallic flue. Huge glass surfaces open onto the protected garden areas and create a beautiful light effect at night, emanating a soft glow which illuminates the surrounding olive grove. 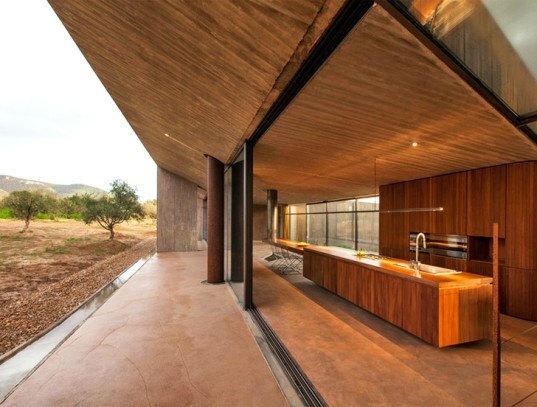 The rugged quality of the concrete is juxtaposed with the lightness of the glass and fits perfectly into the landscape.